And the 'Biggest Simp of the Year' award goes to...Okay, okay, that was mean and uncalled for. I'm all for another man stepping in and treating someone else's kids as his own so I have to give Kroy Biermann props for wanting to legally adopt Kim Zolciak's two eldest daughters, Brielle and Ariana. TMZ is reporting that Kroy is tooting his booty all the way over to an Atlanta courthouse this week to ask for legal custody of the girls. 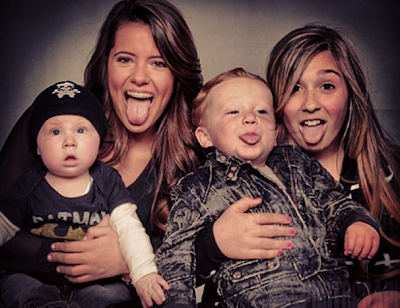 Their biological fathers (the girls have two different daddies by the way) are not in their lives and after Kroy was suckered into marrying Kim, he became the only father figure in their lives. Isn't Brielle almost 18 at this point? What the hell she need him as her daddy for (except for obvious reason$). I wonder what Kroy's parents think about this?